Acura RSX 2005-2006 US mkt, Type-S. Acura RSX 2005-2006 Canada mkt, Type-S. Vehicle Model: RSX. Part # or Vehicle Model: RSX. Vehicle Make: Acura. Vehicle Year: 2006. Nova Scotia (15%) HST. Ontario/New Brunswick/Newfoundland (13%) HST. Model: ACURA RSX. ACURA RSX 05-06 Canada market, premium, AT. ACURA RSX 05-06 US market, Base, AT. Throttle Body/valve Assy. All rebuildable vehicles and body parts are sold on an "as is" basis. Body Part Grading. LKQ SKU: LKQ720 ~200566836 THB60998. This is NOT a manufacturer part number, and can be disregarded. We do our best to prevent these issues from happening and apologize for any inconvenience it may cause. LKQ SKU: LKQ140 ~206311473 THB60996. This is NOT a manufacturer part number, and can be disregarded. We do our best to prevent these issues from happening and apologize for any inconvenience it may cause. LKQ SKU: LKQ842 ~170298620 THB61002. This is NOT a manufacturer part number, and can be disregarded. We do our best to prevent these issues from happening and apologize for any inconvenience it may cause. 2006 Acura RSX HATCHBACK TYPE-S 6 Speed Manual 2005 Acura RSX HATCHBACK TYPE-S 6 Speed Manual. Part/Notes: THROTTLE BODY. -Life is life and issues arise; people make mistakes. LKQ SKU: LKQ725 ~208321679 THB60996. This is NOT a manufacturer part number, and can be disregarded. We do our best to prevent these issues from happening and apologize for any inconvenience it may cause. LKQ SKU: LKQ712 ~148428525 THB60880. This is NOT a manufacturer part number, and can be disregarded. We do our best to prevent these issues from happening and apologize for any inconvenience it may cause. Honda CIVIC HATCHBACK 2005 SI, SI (SIDE SRS) 5 Speed Manual Honda CIVIC HATCHBACK 2004 SI, SI (SIDE SRS) 5 Speed Manual Honda CIVIC HATCHBACK 2003 SI, SI (SIDE SRS) 5 Speed Manual Honda CIVIC HATCHBACK 2002 SI, SI (SIDE SRS) 5 Speed Manual. Acura RSX 2005-2006 US mkt, base, MT. Acura RSX 2005-2006 Canada mkt, premium, MT. Vehicle Model: RSX. Part # or Vehicle Model: RSX. Vehicle Make: Acura. Vehicle Year: 2005. Nova Scotia (15%) HST. Ontario/New Brunswick/Newfoundland (13%) HST. 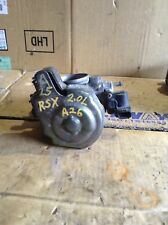 Came of a 2002 - 2004 Acura RSX Base . Condition is Used, comes exactly as pictured. Thanks for looking. Acura RSX 2005-2006 US mkt, base, MT. Acura RSX 2005-2006 Canada mkt, premium, MT. Vehicle Model: RSX. Part # or Vehicle Model: RSX. Vehicle Make: Acura. Vehicle Year: 2006. Nova Scotia (15%) HST. Ontario/New Brunswick/Newfoundland (13%) HST. Acura RSX 2005-2006 US mkt, base, MT. Acura RSX 2005-2006 Canada mkt, premium, MT. Vehicle Model: RSX. Part # or Vehicle Model: RSX. Vehicle Make: Acura. Nova Scotia (15%) HST. Ontario/New Brunswick/Newfoundland (13%) HST.